Planning for a short budget escape? Enjoy great bargain by picking our Budget Glimpse Singapore, designed for four nights and complete with hotel stay, airport pick up and drop off, and exciting guided excursions and activities. 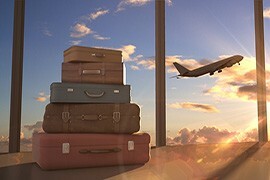 So, with this all-inclusive money-saver break, you can leave the stress of organizing and executing a budget holiday behind and get ready for a retreat of unbeatable value and quality. Kick off your vacation with an impressive city tour. See the classic Merlion Statue, explore the glitzy landmarks across Marina Bay, Orchard Road etc, and lose yourself in the buzzing vibe of Little India and Chinatown. 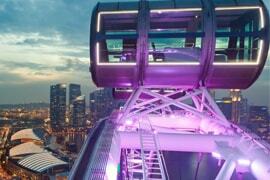 You’ll then head to Singapore Flyer to witness the dazzling cityscape from an unequaled perspective. This includes a 30-minute spin in one of its bus-size capsules which is air-conditioned and can seat up to 28 people. 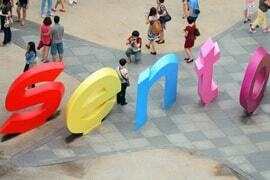 More exciting and spellbinding experiences await you on a half day Sentosa Island tour. Take an astonishing cable car ride and enjoy some of the island’s greatest attractions such as Madame Tussauds Museum, Images of Singapore LIVE, and Wings of Time. 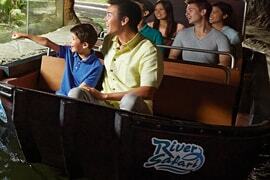 Lastly, reward yourself with a distinct wildlife experience on a trip to River Safari Park. Discover intriguing river habitats, catch up with over 5000 animals, take a thrilling boat ride, and relish a delightful lunch. I give this tour a thumps up! I had always wanted to visit Singapore but could not as it seemed to be beyond my budget. However, with this tour package by Rayna, my dream came true! Thank you Rayna for offering this amazing tour package that helped me to go on a city tour, River Safari and Sentosa Island within my budget. The hotel stay was also comfortable. Glad to have come across this tour company. Looking forward to more such vacations! It was really a budget package! I am thankful for Rayna Tours for designing a Singapore holiday as per my budget. The tours were great; I believe that we got the best of Singapore within our budget. The hotel room we stayed during the trip was quite comfy. Also, all our transportation was taken care of. We really got the best deal and the best holiday. Kudos to Rayna!